While we’ve been getting PHENOMENAL submissions, we love a good list and thought this Top 5 Reasons to Submit an Event post would be a push in the right direction for those of you who are sitting on the fence! 1. Globally, we’re in the middle of a huge shift. One of these changes is a huge commitment from so many people to change the narrative of what is possible from Africa – and by extension, Africans. This is your chance to join the movement and do the work to change outcomes! 2. There is no limit to what your event can be about. Social Media has changed the way we do just about everything. That said your event can be about art, music, e-commerce, marketing and so many other things. Remember the theme: “Upwardly Mobile: The Rise of A Connected Africa” must be firmly imbedded and explored in your idea. 3. Social Media Week Lagos changes lives! 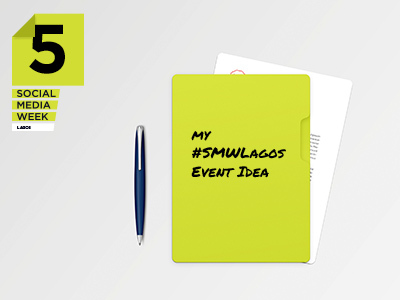 In the two years SMW Lagos has been running, event partners and participants have consistently had incredible opportunities come their way. There is no telling the life-changing connections you can make that could take you to the next level. Don’t believe us? Read here, here and here! 4. Geography is not a limiting factor! The beauty of the internet and the advent of things like Skype and Google Hangouts make it possible for you to host your event from anywhere in the world as long as you have an internet connection. 5. Last year alone Social Media Week Lagos had a social reach of 160 million! This is an opportunity not only to challenge yourself to get outside of your comfort zone and learn new skillsets but also to get out in front of a totally new marketplace in one of the world’s fastest-growing economic centers. Get that event in – submissions close on December 12. Upload your event details here!